Hello, and welcome to the first installment of Good Day Nintendo, where we interview the characters and creatures of the games you know and love so well! Today, we interview Mario and Luigi, twin brothers who rescue the Mushroom Kingdom...uh, from the brink of disaster on a regular...I'm sorry, but who are you? Mario: We're sorry. Once he found out about the interview he absolutely insisted on coming. WiiWareWave: I see...well, we'll try to squeeze some questions for him as well. 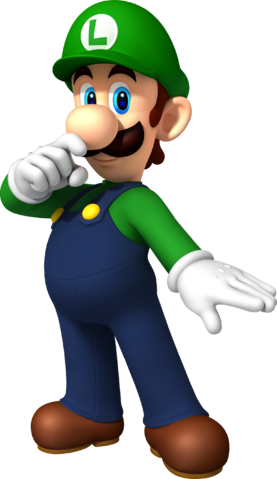 WiiWareWave: The world has just finished celebrating a year dedicated to your role in the Mario series. How was the experience from your perspective? Luigi: It was certainly a far cry from what I'm used to. In fact, I heard reports that my cries of joy were heard all the way in Sarasaland when I found out. WiiWareWave: And how were you informed of this? Luigi: Well, Daisy - she's the princess of Sarasaland - called me to see if I was okay ten seconds after I cried out! Wario: Well, I have the loudest belch in the world! Wanna hear? WiiWareWave: Wii U owners are anticipating the upcoming release of Mario Kart 8. Are there any secrets you can tell us? Wario: You wanna hear my belch now? WiiWareWave: No, we have a question for you. WiiWareWave: So your friendship with Mario got off to a rocky start. Any thoughts you'd like to share? Wario: What's to share? I-a saw a nice castle, I-a squatted in it, I-a was kicked out by its rightful owner. Next question! WiiWareWave: Uh...okay. What's the deal with Waluigi? Is he your brother? Cousin? Father? Son from the distant future? Some lookalike who keeps randomly turning up at big events? Wario: ...huh? Sorry, I wasn't paying attention. Next question! WiiWareWave: Okay then. How is it running your own game company, WarioWare, Incorporated? Wario: "Incorporated"? No, no, it's WarioWare, Inc., like the ink of a delicious Blooper ink milkshake. WiiWareWave: Thank you for that disturbing mental image. Wario: You're welcome. Hey, you're not a bad guy at all! Wario: Wait a minute...I-a know why you don't wanna hear me belch! You're a fart guy! Join us next time when we interview Pokémon Trainer Red. See you then! A big thank you to mariowiki.com for the images! Wario why must you ruin the most important interview our website has ever taken part in. His very presence was torturous. He smelled as though he'd eaten a big plate of garlic, then took a swim in a pool filled with mashed garlic (waiting half an hour before doing so, naturally), then had a garlic shower, then rubbed his underarms with garlic as (de)odourant, and finally put on underwear made from garlic. My eyes watered the whole time - they still haven't stopped! April Fools is always a funny day in this community! Nice April Fools Day article my friend. The funny thing is that even though I originally intended this as an April Fool's article, I'd really like to write it as a regular feature. That would be a unique and interesting recurring feature! Next time we interview Red from Pokémon Red, Green and Blue.